Colleges tend to expand beyond their original missions by hiring more administrators and creating new programs. But they can also expand physically by exercising power usually reserved for state and federal governments. When that happens, universities can abuse their power and undermine the public good. For a prime example of this expansion, look at how public universities use eminent domain. Universities have used this power to build sports arenas and parking lots, and evict students from university property that is then leased to private companies. Unless the public notices these abuses early, universities are rarely stopped from claiming property. Eminent domain is the government power of taking private property for public use, with compensation paid to the owner. When used carefully, this taking can be justified and not spark public opposition. For example, it would be nearly impossible to build highways or hospitals in some urban areas without resorting to eminent domain. Though eminent domain has a legitimate purpose and motive, its use can stoke public outrage and skepticism. Property grabs and unnecessary government projects are littered throughout history. In notable cases, such as Kelo v. City of New London, private property is obtained by the government through eminent domain—and then given to private interests. The documentary Little Pink House focused on Kelo as a stark example of eminent domain abuse. 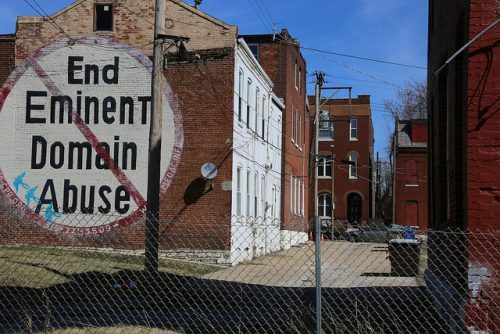 After Kelo, 42 states restricted the acceptable uses of eminent domain: 23 states prohibited it for economic development purposes, 12 limited it to “public use,” and another 12 limit it in regard to blight. The process for approving university use of eminent domain varies by state. Some states have independent review boards, whereas others only require approval from a university board of trustees or a few campus officials for eminent domain claims. Multiple calls by the Martin Center to university officials for clarity on eminent domain went unanswered. The process for how universities make an eminent domain claim isn’t transparent, and even basic records and statistics on how colleges use eminent domain are non-existent beyond scattered news reports. In Idaho, Boise State University wanted to build a baseball stadium on the parking lot of the local Biblical Studies Center and two apartment complexes—even though Boise State does not have a baseball team. As they recruit a team, Boise State lawyers are waging a legal battle for land upon which they will build a $10 million stadium. Some eminent domain claims end up being costly and overly burdensome. The College of the Desert in southern California initially offered $9.6 million for an outdated shopping mall before filing an eminent domain claim. But, after a months-long legal battle with the property owner, the school paid $22 million for the property. This new total does not account for the cost of renovations or repairs. Community colleges, too, have used eminent domain. In 2017, Collin County, Texas passed a $600 million bond to upgrade its community college system. The Collin Community College system master plan includes building new campuses and several student centers. In order to build a new campus in the city of Wylie, trustees voted to seize 9.9 acres of land after the property owner refused to sell. In some cases, “eminent domain” is stretched to justify completely unrelated actions. In February, campus officials at the New York Rensselaer Polytechnic Institute removed two students from a public sidewalk for passing out buttons and fliers criticizing the university during a hockey game. Somewhat ironically, the students were supporting the “Renew Rensselaer” alumni initiative that sought to expose administrators’ abuses of power. Security officials stated that the school controlled the property through eminent domain and had the right to remove the students. Colleges have used eminent domain to build housing for students, but now they have expanded into the hospitality business for non-students, too. In 2012, Ball State University used eminent domain to claim land from a private business to build a hotel, conference center, restaurants, and a partial dormitory for hospitality students to gain hands-on experience. Even when colleges succeed in taking land, doing so can harm the school’s local reputation. If universities go too far, the public may turn to the legislature to constrain school ambition. In 2015, for example, Northeastern Illinois University (NEIU) attempted to obtain Bryn Mawr Avenue in Chicago to turn it over to private developers. The action so irked some Chicagoans that they pushed for legislation (HB 2558) to allow universities to “use eminent domain only when their current land reserves are insufficient for a development” and restricted them from “using eminent domain to give land for the ownership or use of private third parties.” But ultimately, HB 2558 did not pass and NEIU obtained the property. It then gave the property to American Campus Communities Inc., a private university housing corporation, to provide students with housing options for the financially struggling Illinois University. Upon examining university use of eminent domain and its results, it’s clear that this power should be reserved for the most extreme cases of need—or, better yet, never used. It harms university reputation, is easily abused by university officials, and is costly to taxpayers who foot the bill for unnecessary expansions. Unless state legislatures restrain this practice, colleges will continue to use government power while the public remains in the dark. Chris West is a policy fellow at the James G. Martin Center for Academic Renewal.